Where's the next Republican convention? With all of the coverage of the Larry Craig arrest, guilty plea and resignation this week a common joke has been "Where is the next republican convention going to be? The Minneapolis airport bathroom?" Has no one bothered to actually check? 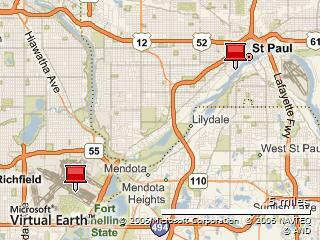 For those who don't know, the 2008 Republican National Convention is being held less than 10 miles away, across the river in St. Paul at the Xcel Energy Center, home of the Minnesota Wild. That's right... the Democratic People's Republic of Minnesota... the state where nothing is allowed, the state that has one of the highest tax burdens in the nation, a state that shuns the rights of private property owners will be playing host to the convention of a party that stands against most things the DPRM believes. This is the very city also plans to work hard to welcome protestors and protect their right to protest. I wonder if they'd do the same if the roles were reversed. Like Joe Soucheray, I wonder why they picked that place. Do they really think they'll be able to swing it back to being a swing state? After all, this is a state that hasn't gone to a Republican since 1972... even when they were the only state going to a Democrat in 1984.